Hands-on • A brick-and-mortar store allows people to see just how fast the Internet speeds are. Vince Horiuchi | The Salt Lake Tribune Google Fiber officially launched in Provo Friday, providing super-high-speed Internet access for residents. Vince Horiuchi | The Salt Lake Tribune Google Fiber officially launched in Provo Friday, providing super-high-speed Internet access for residents. Provo • Provo is now an official Google Fiber city. The giant California-based search engine company announced Friday that it is now hooking up customers to its new high-speed Internet service and has opened a brick-and-mortar store for people to see just how fast it is. "It&apos;s a warm environment to come into and get hands-on experience with Google Fiber," John Richards, Google Fiber&apos;s head of operations for Provo said about the Google Fiber Space store, which opened Friday in The Shops at Riverwoods retail center, 4801 N. University Ave. The store includes PC setups and televisions that demonstrate the speed of the service for Internet surfing and watching television. Google is offering three plans for Provo residents, starting with a free plan that gets you Internet speeds of 5 megabits download and 1 megabit upload for seven years. There is a 1-gigabit per-second download and upload Internet-only plan for $70 per month. And for $120 per month, customers can have the 1-gigabit Internet connectivity plus cable television. The television plan includes about 350 basic cable channels (it&apos;s $10 extra per month for a pay-TV service like HBO) and a DVR box with 2 terabytes of storage capable of storing up to 500 hours of HD programming. It also can record up to eight television shows simultaneously. "We have been saying that if you need to record eight channels at a time, you&apos;re watching enough TV," Richards quipped. Customers will be able to sign up for Google Fiber either online by going to google.com/fiber/provo or by going to the Google Fiber Space store. 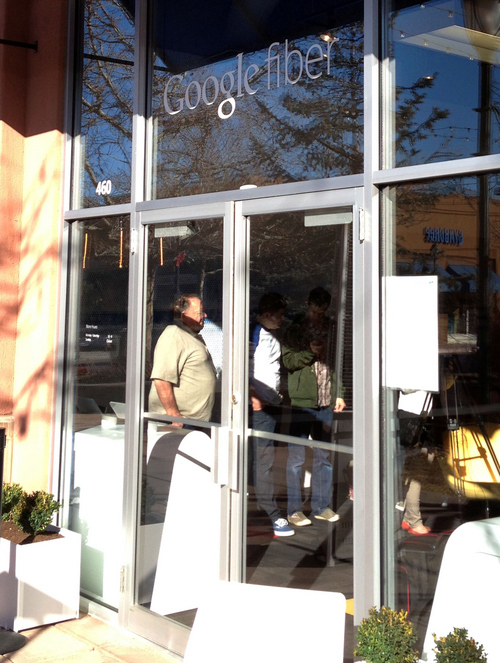 There also is a second store and Google customer service center at 250 W. Center St. in Provo. How soon a customer gets hooked up depends on where he or she lives. The map of Provo has been divided into seven areas or Google "fiberhoods" where installation is done in order. "We can&apos;t do the whole city at once, but fiberhood by fiberhood," Richards said. "Your location will determine how quickly you get hooked up. There&apos;s installations going on every day. We&apos;re getting everyone hooked up as fast as we can." The service ultimately will be available to nearly all of Provo&apos;s 38,000 homes by the end of the year. It currently is not, however, available to businesses, according to a Google Fiber spokeswoman. She did not know when they will start hooking them up. Early last year, Google announced that Provo would be the third U.S. market to get the high-speed Internet service. Kansas City and Austin, Texas were the other two. No other cities have been announced since. In a deal with Provo, Google took over ownership of the city&apos;s current fiber-optic Internet network known as iProvo. Google promised it would upgrade the technology and provide residents the free Internet tier for seven years in exchange for the network. It also promised it would provide free gigabit service to a number of public buildings such as libraries and schools.